This is not your typical chicken and rice soup recipe. This soup is an ode to my Puerto Rican heritage. We make a delicious arroz con pollo (chicken and rice) and I used the leftovers once to make a soup. We LOVED it. The problem was, I didn’t want to have to make arroz con pollo every time I wanted this soup. 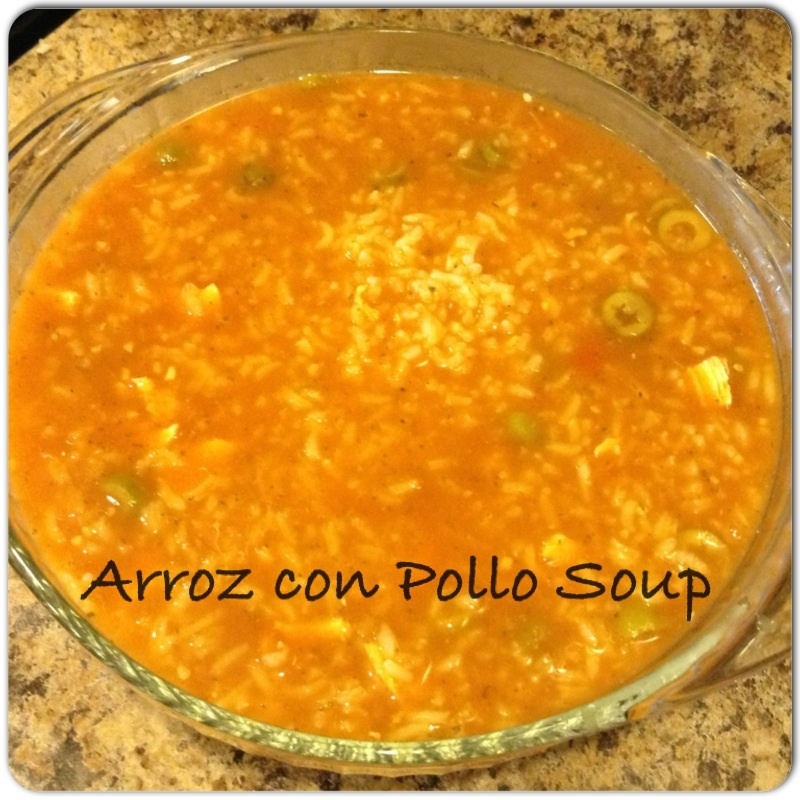 I decided to try my hand at re-creating the taste of arroz con pollo in soup. The key to this recipe is the sofrito. Click here to read how to make it. It’s really easy and only requires a blender or food processor. 1. Cook the rice. I use a rice cooker. 2. Use a large pot. Put the first seven ingredients in the pot. Bring to a boil and then simmer while the rice cooks. 3. When the rice is ready, add the rice and chicken. Simmer until the chicken is heated through. Note: The longer the rice simmers, the thicker the soup will become. Eat it right away if you like a thinner soup or let simmer a while longer if you want a thicker soup. Also, If you don’t have rice, try adding noodles instead of the rice. Allow enough time for the noodles to cook in the broth. I tried this last week and it was equally delicious! This has become a family favorite and I make it when I have leftover chicken. It also freezes well. I took this soup with us on vacation and added a little chicken broth to the frozen hunk and it worked beautifully. Do you have any favorite soup recipes to share?